Book review...cause nothing is ready to show! Sorry folks, everything I'm working on is at the stage where they aren't worth showing, so...guess what?....a book review!! This is yet another of those books that I love, but have never used to make anything. I should be ashamed because it's a good book. I quote: "From snow globes and paperweights to jewelry and pillows..." and " Using popular techniques including collage, needlework, rubber stamping, and more, you'll find ideas for making memory projects from the cherished collectibles previously tucked away in a drawer or cabinet." I'll bet that title got your attention!! 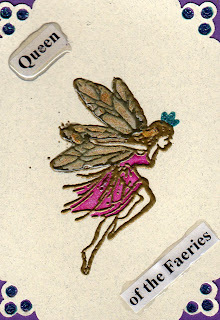 Today was our CQTeer meeting and these atc's are the ones I received for the queen theme swap. The technique we learned was 'toilet paper casting' using rubber stamps. What fun that was and I love the results. And before anybody asks, the toilet paper wasn't used already :) It's the type of technique I like...cheap supplies and a near result. Can't wait to do more of these! Here's another bag I just finished making this afternoon using some of the denim I have in my stash, along with some bright orange cotton print I have lurking about. Sorry the picture has turned out rather dark. This one has four pockets on the outside and I put two more on the inside so there's lots of space for storage. I think that next time I would make some sort of tab to hold it closed at the top because it seems to gap open a bit too much. That might be rectified once it has 'stuff' inside though. Now I'm off to start another design! Our challenge for week 21 is the Crossed Buttonhole Stitch - another one I have never attempted. I like it! I'm running late this week so I've only used it in one place, but I can see all sorts of possibilities for it. I began this seam treatment with one row of ordinary buttonhole (which is showing at the bottom of the picture. Then I added another row of crossed buttonhole above that. 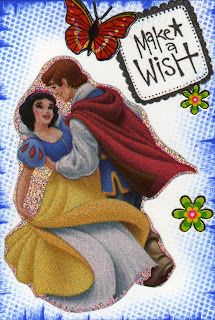 'Extras' include beaded flowers, french knots and daisy stitch. I used pearl cotton for the stitches. I actually got some work done today! 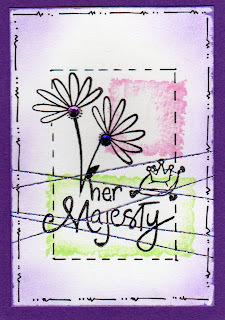 I finished the shopping cart cover and worked on these two atc's for our CQTeers Swap. The theme this time is 'queen'. 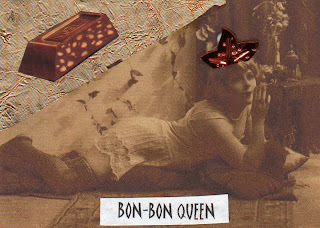 I had such fun with both of these, but most especially the Compost Queen. 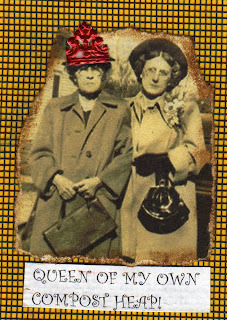 The image (which I had downloaded some time ago from www.aisling.net) of the sour-faced woman on the left somehow suited compost...or at the very least, the way it smells!! Her crown is made from a small piece of German scrap I got from www.artchixstudios.com. The scan doesn't show the metallic candy wrapper I used on the upper left very well, but it's a beautiful shade of copper. Her crown is a sequin. No crafting done here today...I'm nursing a sore back which is entirely my own fault for sleeping under the fan last night. 'Nuff said. So...in lieu of pictures here today...I have something fun for you to check out! Go to www.layersuponlayers.com and scroll down to the entry of May 23rd for some pretty cool fencing!! Enjoy. I have nearly finished the work on this shopping cart cover. The fabric I'm using is what you see behind the pattern picture. Taking a picture of that just looks like a blob of fabric...pretty, but a blob. All I have left to do is insert the elastic. Normally I like McCall's patterns, but this one should have an instruction revision I think. Either that, or I'm particularly dense at the moment. I've stumbled onto another fun blog... http://thewonderfulworldofnothing.blogspot.com Don't go there expecting crafts because there aren't any. It's written by an office worker and is very funny. The mail was exciting today (no bills for a change). My Stitches in Time atc swap arrived and the art is so cool!! I really can't pick a favourite because they are all great. The other three atc's arrived too ...the details are incredible. Each time I look at them I see something new. If anyone is contemplating joining a swap, do it because you won't regret it. I'm so happy with what I've received. The mail also brought the guide for the breast cancer support fundraiser I'm involved in. If you're interested in seeing my donation quilt (wall hanging) go to www.TheQuilt.com and look for quilt #113 in the Stratford exhibition. It's called Ribbons of Hope. While you're there, it's well worth a surf through all the other quilts that have been donated. Enjoy! I should have posted yesterday, but I forgot what day it was. For those that don't live in Canada, this past weekend was our 24th of May long weekend...more commonly known these days as the May 2-4. Come to think of it, I don't remember posting on Saturday either! In my defense, my DH came down with pneumonia & it currently on some pretty heavy-duty meds, which are making him somewhat loopy. Now I know what he'd be like if he did recreational drugs!! Scary thought. Because there's been a decided lack of creativity on my part over the past few days, I decided it was time for another book review. 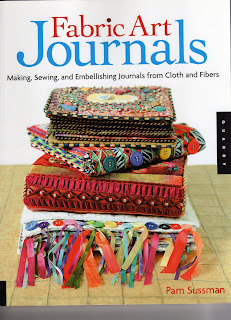 "In Fabric Art Journals....Pam Sussman guides you through the process of creating tactile, beautiful books and journals from cloth. The book explores...painting, dyeing, writing techniques, decorative stitching, machine an dhand embroidery, image transfers and quilting. " There are a large number of coloured photos and an extensive gallery at the back of the book. 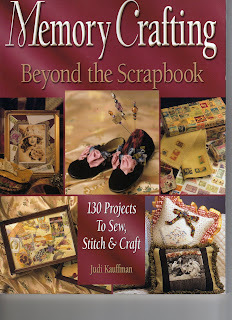 I have yet to try making anything from this book, but it's on my to-do list. I would say that this book would be a good general how-to book, but if you're beyond a beginner and looking for more in-depth information another publication might be more valuable to you. Looks like I made an Ewok! This bear is very fuzzy. I think the fur is raccoon but I'm not sure. Right now he's sporting a white bow, but that will change once I know whether it's a boy or a girl. Now I'm off to make a receiving blanket. I've had a request from someone wanting me to make sheep from her old persian wool coat. Who knew that sheep patterns were non-existent? 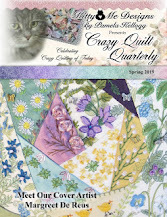 Do any of my readers know of a book or pattern that might be available? I'm looking for something that looks like a sheep, not something too cutesy. I told her that a bear might be her only option if I'm unable to find what she wants. Anyway, I thought I'd throw it out here and see if anyone can point me in the right direction. Sorry, no pictures today. It's been a rather disjointed day and I didn't make as much progress on the fur bear as I had hoped. Right now he looks like he's been be-headed (mainly because he hasn't got one!) and is in no shape to have his photograph taken. Keeping my fingers crossed for more time tomorrow. Interesting title for this post! Today I started working on a fur bear and cleared out my 'bin' of fur coats first. I have altogether too much so a lot of this is on it's way out, out, out. And before anybody gets excited...none of these coats were mine!! Wearing dead animals just isn't my thing, but I'm not upset to make bears out of them. The other pictures show my last month's homework for the CQTeers group. The theme was monochromatic. Weeks 19 and 20 of the Take a Stitch Tuesday challenge (www.inaminuteago.com/blog) included two stitches I have never done, so I pretty much stuck to the original stitch without trying to change it. Week 19 is the Basque Stitch which is in the left picture. I did a double row so that it would be on both sides of the seam. I know I will use this stitch a lot! Week 20 is the Butterfly Chain Stitch. I love Sharon's samples so couldn't wait to try this one. It, too, will become a favourite. I added beads in between, just to add some sparkle. Magpie's like sparkle!! If you would like to learn to make either of these stitches, just go to Sharon Boggon's site at www.inaminuteago.com and look for her stitch dictionary. Today I had a long-overdue sew day with a couple of friends. Had a great time getting together and catching up with each other and our lives. So, in lieu of a picture from me today, check this out....Sharon B on www.inaminuteago.com/blog has a very interesting article and lots of pictures today on 'how to use transfer dyes to print on synthetic fabric'. It looks like a really cool technique and one I've never seen done before. Enjoy! I made this bear today from fake fur for a baby gift. I'll put the bow on once I know whether it's a girl or a boy. It's made from the same pattern as I used for the chenille one yesterday. Next I'll be working on a 'real' fur one, which will be much more detailed. It will have moveable limbs, which this one doesn't. This bear is meant to be loved and not put on a shelf. I finished this cuddly bear today, which is a gift for my SIL and is made from a recycled chenille bedspread she gave me awhile ago. This bear is actually a test run for the next one I'll be making using fake fur. I wanted a bear that is suitable for a baby to cuddle with and is a little on the soft and squishy side. I think this one will do nicely. Tomorrow I will start working on it. I'm a week behind in the Take A Stitch Tuesday challenge, but better late than never! Actually, I was saving a spot on this bear to play with the stitch and you can see the results in the close-up picture. The bear is one that was sent around in the latest round robin in the group I belong to. It's a fairly simple pattern with a minimum of seaming to allow for easier embellishing. Clicking on the pictures will give you greater detail. Now I'm off to start making three more bears...one of real fur, one from a recycled chenille bedspread, and one from fake fur. All three are for gifts. Enjoy your day! singing...."I'm So Excited and I Just Can't Hide It"
I know, I know, I'm off-key but hey, the words fit the treasure-trove that arrived in the mail today from my friend and I'm excited enough that I don't care how off-key I am! For those who want to know, the song is off the soundtrack for 'Beverly Hills Cop'. Anyway, there are books full of pretty cool images for use in my art work AND (doing happy dance right now) some kensita silks AND a dragonfly and basket of flowers for use in my CQ's. As soon as I saw the silks I knew what I wanted to do with them. 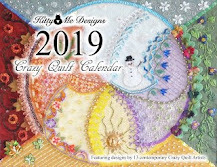 Since I'm in the downsizing mode with my stash I'll make cq squares with a silk as the focal point in each one and then put them all together in a quilt. I'm not promising a finished quilt anytime soon because I work slowly, but it's a perfect idea. Aren't they pretty? I'm such a lucky girl to have such a good friend. Thank you Jan! A note about the pattern for the knitted denim bag I made...the pattern can be found here: http://www.magknits.com/Nov05/denim.htm for anyone who is interested. I've had a couple of people who asked. Enjoy! This is the back of the bear, which I think is finished. I have a couple more little things to add to the front pieces and it's ready to put together. Today I added the embroidered flower in the centre (shaded purple embroidery floss) and to the right of that I added the grape vine and beaded grapes. I also stuck a few charms here and there to finish off areas. The next time you see this it should be finished (I hope). ...more commonly known as piles! I have piles, and piles, and piles, and it's a painful process getting rid of them. Don't think any amount of Preparation H is going to help with this, do you? This is my stack of fake fur, along with a curious cat and dog. Most of this is on the way out - I'll only be keeping a couple of smallish pieces in case I should feel inspired to make a bear anytime soon. Next up is my huge box of real fur (also kept for bears and trim on santas). It, too, is destined for an overhaul. Hmmm....is my house sitting higher off the ground? Surely it must be with all this stuff heading out the door! Sorry folks, no pictures again today. I spent the day helping a friend (who shall remain nameless to protect the not-so-innocent) drastically downsize her collection of fabric 'bits'. It's amazing just how much stuff we manage to accumulate in the name of 'might use it - someday' and that someday just never comes. Done that, been there and have downsized my stash mightily already and now it's more than ready to be done again. I know I've posted this before, but since there's an interest right now in what to make from denim, I thought I'd show it again. This bag is made from 1/2" strips of denim and is knitted using a circular needle. The handles are made using the 'seam' up the leg and are just braided together. Enlarging the picture will show that the top of the bag is the waistband. It's not a process I would choose to do very often. Knitting with denim is rather hard on the hands I found. I love the end result though! Sharon of www.inaminuteago.com/blog posed the question of what to do with recycled denim, so I thought I would post this again. I have used all sorts of denim pieces in this jacket, in the CQ style, utilizing some pockets and labels too. I've made a number of these jackets and find they're a great way to use up denim! I've also attempted knitting with denim strips too, which isn't something I would highly recommend. I liked the end result, but my hands didn't! Now, isn't this a beautiful flower? It's the one and only for this year, which is a bit of a disappointment when my other plant was absolutely covered. I 'think' this might be another orchid cactus (can you verify Arlee?). All I can say is the picture doesn't do it justice. On the topic of standing in bed (which is an expression my mother used when she was having a bad day)...the day began while I was still in bed (as days tend to do, I know). There was an odd noise. Maybe a car alarm going off somewhere? Hmmm....didn't sound like a car alarm. An alarm clock? No. Suddenly my feet hit the floor running as I realized that it must be Dad's personal alarm going off. Either he'd fallen or hit it and set it off. Guess which it was? By the time I hit his door at a mad dash, the phone was ringing. Yep, the alarm company. Four trips up & down the stairs later, we got that sorted out. Heart sort of returned to normal. Part two..remembered that today Jacquie and I get together for our sewing time...my turn, so have to made something to eat with our coffee. I had found a pretty interesting recipe yesterday, so undertook to make it. Well. The cookies looked good when they came out of the oven. OK...take them off the pan, which is where the next problem arose. They wouldn't come off!! Stuck like glue. Wrestled them off in pieces (and yes, before you ask, I DID remember to grease the pan). My next mistake was to put them to the taste test. Yeeeewwwww.....they were SO sickeningly sweet and my teeth are still aching. Can't serve those! So...hmmm....what next? I know...a cake!! I have an easy recipe for a cake. Made cake, put in oven, and came out looking rather edible. Had a piece for lunch and yep, it was ok.
Part three....checked my calendar and guess what? I'm supposed to be going to Jacquies and it's HER turn to bake!!!!!!!!!!!!!!!!!!!!!!!!!!!!!!!!!!!! Yep, should have stood in bed. P.S. Forgot to mention that in around all this I cleaned my workroom too...so we would have room to work.